I read an article today on Women's Wear Daily online (wwd.com) announcing that Bon Appetit magazine would be making some big changes come January 2008. I am quite alarmed by this announcement. 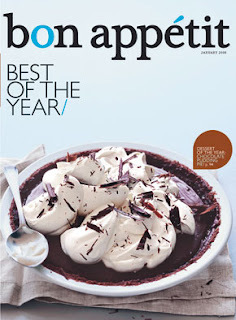 Bon Appetit is that classy epicurean glossy with all-star recipes, interviews, kitchen gadget reviews, and tips on entertaining. My favorite part is the R.S.V.P. section near the front, where readers write in asking Bon Appetit's staff to go after a particularly memorable recipe from a restaurant the readers dined at, and then publish the recipe. I love seeing recipes from restaurants I have been to, sometimes even for dishes I have ordered. I fully intended to write in to Bon Appetit one day to ask for a recipe. Let's hope that with the big new changes at the mag, they won't cut R.S.V.P. If they do, I won't be R.S.V.P.ing for their mag anymore. But about their big changes. One thing they are doing is making the logo a little friendlier and hipper. They are going from all capital letters in monochromatics, to all lowercase letters and an "o" and accent on the "e" in a different color than the rest of the letters. The WWD article says the mag hasn't changed its logo in 17 years. Ok, the logo alone won't kill me; in fact, the fresh look might be, well, refreshing. But what might do me in is the new focus, as it tries to appeal to younger audiences by giving more step-by-step instructions. Way to shut out your fan base, Bon Appetit, you know, the ones who don't need hand-holding in the kitchen. I understand their desire, and more so, need, to lower the average reader age from 50 to 20s and 30s, but man, that really stinks for the faithfuls like me. I view it as wasted space of prime paper real estate to explain to me things I already know. Show me how to knead dough and you can show me the door. And yes, maybe I am more like a 50 year old woman than like a twentysomething.